Edema is a condition of abnormally large fluid volume in the circulatory system or in tissues between the body's cells (interstitial spaces). Normally the body maintains a balance of fluid in tissues by ensuring that the same of amount of water entering the body also leaves it. The circulatory system transports fluid within the body via its network of blood vessels. The fluid, which contains oxygen and nutrients needed by the cells, moves from the walls of the blood vessels into the body's tissues. After its nutrients are used up, fluid moves back into the blood vessels and returns to the heart. The lymphatic system (a network of channels in the body that carry lymph, a colorless fluid containing white blood cells to fight infection) also absorbs and transports this fluid. In edema, either too much fluid moves from the blood vessels into the tissues, or not enough fluid moves from the tissues back into the blood vessels. This fluid imbalance can cause mild to severe swelling in one or more parts of the body. Immobility. The leg muscles normally contract and compress blood vessels to promote blood flow with walking or running. When these muscles are not used, blood can collect in the veins, making it difficult for fluid to move from tissues back into the vessels. Heat. Warm temperatures cause the blood vessels to expand, making it easier for fluid to cross into surrounding tissues. High humidity also aggravates this situation. Medications. Certain drugs, such as steroids, hormone replacements, nonsteroidal anti-inflammatory drugs (NSAIDs), and some blood pressure medications may affect how fast fluid leaves blood vessels. Intake of salty foods. The body needs a constant concentration of salt in its tissues. When excess salt is taken in, the body dilutes it by retaining fluid. Menstruation and pregnancy. The changing levels of hormones affect the rate at which fluid enters and leaves the tissues. Heart failure. When the heart is unable to maintain adequate blood flow throughout the circulatory system, the excess fluid pressure within the blood vessels can cause shifts into the interstitial spaces. Left-sided heart failure can cause pulmonary edema, as fluid shifts into the lungs. The patient may develop rapid, shallow respirations, shortness of breath, and a cough. Right-sided heart failure can cause pitting edema, a swelling in the tissue under the skin of the lower legs and feet. Pressing this tissue with a finger tip leads to a noticeable momentary indentation. Kidney disease. The decrease in sodium and water excretion can result in fluid retention and overload. Thyroid or liver disease. These conditions can change the concentration of protein in the blood, affecting fluid movement in and out of the tissues. In advanced liver disease, the liver is enlarged and fluid may build-up in the abdomen. Malnutrition. Protein levels are decreased in the blood, and in an effort to maintain a balance of concentrations, fluid shifts out of the vessels and causes edema in tissue spaces. Blood clots. Clots can cause pooling of fluid and may be accompanied by discoloration and pain. In some instances, clots may cause no pain. Weakened veins. Varicose veins, or veins whose walls or valves are weak, can allow blood to pool in the legs. This is a common condition. Infection and inflammation. Infection in leg tissues can cause inflammation and increasing blood flow to the area. Inflammatory diseases, such as gout or arthritis, can also result in swelling. 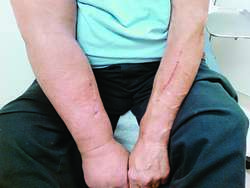 Lymphedema. Blocked lymph channels may be caused by infection, scar tissue, or hereditary conditions. Lymph that can't drain properly results in edema. Lymphedema may also occur after cancer treatments, when the lymph system is impaired by surgery, radiation, or chemotherapy. Tumor. Abnormal masses can compress leg vessels and lymph channels, affecting the rate of fluid movement. Symptoms vary depending on the cause of edema. In general, weight gain, puffy eyelids, and swelling of the legs may occur as a result of excess fluid volume. Pulse rate and blood pressure may be elevated. Hand and neck veins may be observed as fuller. Edema is a sign of an underlying problem, rather than a disease unto itself. A diagnostic explanation should be sought. Patient history and presenting symptoms, along with laboratory blood studies, if indicated, assist the health professional in determining the cause of the edema. Reducing sodium intake. A high sodium level causes or aggravates fluid retention. Maintaining proper weight. Being overweight slows body fluid circulation and puts extra pressure on the veins. Exercise. Regular exercise stimulates circulation. Elevation of the legs. Placing the legs at least 12 in (30.5 cm) above the level of the heart for 10-15 minutes, three to four times a day, stimulates excess fluid re-entry into the circulatory system. Use of support stocking. Elastic stockings, available at most medical supply or drug stores, will compress the leg vessels, promoting circulation and decreasing pooling of fluid due to gravity. Massage. Massaging the body part can help to stimulate the release of excess fluids, but should be avoided if the patient has blood clots in the veins. Travel breaks. Sitting for long periods will increase swelling in the feet and ankles. Standing and/or walking at least every hour or two will help stimulate blood flow. The three "Ds"—diuretics, digitalis, and diet-are frequently prescribed for medical conditions that result in excess fluid volume. Diuretics are medications that promote urination of sodium and water. Digoxin is a digitalis preparation that is sometimes needed to decrease heart rate and increase the strength of the heart's contractions. Dietary recommendations include less sodium in order to decrease fluid retention. Consideration of adequate protein intake is also made. For patients with lymphedema, a combination of therapies may prove effective. Combined decongestive therapy includes the use of manual lymph drainage (MLD), compression bandaging, garments and pumps, and physical therapy. MLD involves the use of light massage of the subcutaneous tissue where the lymph vessels predominate. Massage begins in an area of the body trunk where there is normal lymph function and proceeds to areas of lymphatic insufficiency, in an effort to stimulate new drainage tract development. (MLD should not be used for patients with active cancer, deep vein clots, congestive heart failure, or cellulitis.) MLD sessions are followed by application of compression garments or pumps. Physical therapy is aimed at strengthening the affected limb and increasing joint mobility. Dietary changes, in addition to cutting back the amount of sodium eaten, may also help reduce edema. Foods that worsen edema, such as alcohol, caffeine, sugar, dairy products, soy sauce, animal protein, chocolate, olives, and pickles, should be avoided. Diuretic herbs can also help relieve edema. One of the best herbs for this purpose is dandelion (Taraxacum mongolicum), since, in addition to its diuretic action, it is a rich source of potassium. (Diuretics flush potassium from the body and it must be replaced to avoid potassium deficiency.) Hydrotherapy using daily contrast applications of hot and cold (either compresses or immersion) may also be helpful. Digitalis — A naturally occuring compound used in the preparation of the medication, digoxin, prescribed to increase the heart rate and strengthen the force of the heart's contractions. Diuretics — Medications used in the treatment of fluid overload, to promote excretion of sodium and water. Interstitial spaces — Areas of the body occuring outside the vessels or organs, between the cells. 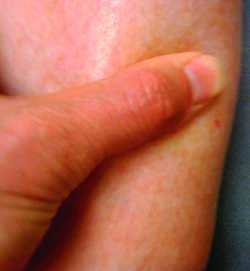 Pitting edema — A swelling in the tissue under the skin, resulting from fluid accumulation, that is measured by the depth of indentation made by finger pressure over a boney prominence. Lymphedema and Wound Care Clinic of Austin. 5750 Balcones Dr., Ste. 110, Austin, TX 78731. (512) 453-1930.
the accumulation of excess fluid in a fluid compartment. Formerly called dropsy and hydrops. adj., adj edem´atous. This accumulation can occur in the cells (cellular edema), in the intercellular spaces within tissues (interstitial edema), or in potential spaces within the body. Edema may also be classified by location, such as pulmonary edema or brain edema; types found in certain locations have specific names, such as ascites (peritoneal cavity), hydrothorax (pleural cavity), or hydropericardium (pericardial sac). Massive generalized edema is called anasarca. Classification by location does not indicate whether the edema is cellular or interstitial or occupies a potential space (for example, brain edema may be either cellular or interstitial). Edema can be caused by a variety of factors, including conditions that affect osmotic pressure, such as hypotonic fluid overload, which allows the movement of water into the intracellular space, or hypoproteinemia, which decreases the concentration of plasma proteins and permits the passage of fluid out of the blood vessels into the tissue spaces. Other factors include poor lymphatic drainage; conditions that cause increased capillary pressure, such as excessive retention of salt and water and heart failure; and conditions that increase capillary permeability, such as inflammation. Edema formation. 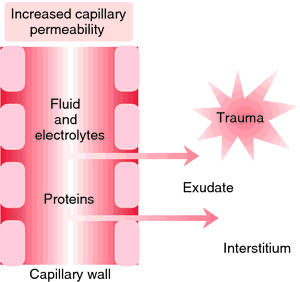 With trauma, increased capillary permeability and dilation cause leaking into tissue space. Initially clear, exudate in the tissue space becomes more viscous with an increase in plasma protein. From Copstead and Banasik, 2000.
alveolar edema pulmonary edema in the alveoli, usually with hypoxemia and dyspnea. cardiac edema a manifestation of congestive heart failure, due to increased venous and capillary pressures and often associated with renal sodium retention. cellular edema edema caused by the entry of water into the cells, causing them to swell. This may occur because of decreased osmolality of the fluid surrounding the cells, as in hypotonic fluid overload, or increased osmolality of the intracellular fluid, as in conditions that decrease the activity of the sodium pump of the cell membrane, allowing the concentration of sodium ions within the cell to increase. cerebral edema swelling of the brain caused by the accumulation of fluid in the brain substance. It may result from head injury, stroke, infection, hypoxia, brain tumors, obstructive hydrocephalus, and lead encephalopathy; it may also be caused by disturbances in fluid and electrolyte balance that accompany hemodialysis and diabetic ketoacidosis. The most common type is vasogenic edema, which may result from increased capillary pressure or from increased capillary permeability caused by trauma to the capillary walls. Cellular edema may occur in ischemia or hypoxia of the brain. Because the brain is enclosed in the solid vault of the skull, edema compresses the blood vessels, decreasing the blood flow and causing ischemia and hypoxia, which in turn result in further edema. Unless measures are taken to reverse the edema, destruction of brain tissue and death will result. dependent edema edema of the lowermost parts of the body relative to the heart; it is affected by gravity and position, so that the lower limbs are affected if the individual is standing, but the buttocks are affected if the individual is supine. generalized edema edema that is caused by poor venous return; it is not localized by the effects of gravity, in contrast to dependent edema. 1. edema caused by the accumulation of fluid in the extracellular spaces of a tissue. 2. pulmonary edema in the interstitial tissues; there is dyspnea but no hypoxemia. nonpitting edema edema in which pressure does not leave a depression in the tissues, such as in cellular edema. See also pitting edema. pedal edema swelling of the feet and ankles. peripheral edema edema affecting the extremities; seen in heart disease, Crohn's disease, and amyloidosis. pitting edema edema in which external pressure leaves a persistent depression in the tissues (see pitting); it occurs because the pressure pushes the excess fluid out of the intercellular spaces in the tissue. See also nonpitting edema. pulmonary edema diffuse extravascular accumulation of fluid in the tissues and air spaces of the lung due to changes in hydrostatic forces in the capillaries or to increased capillary permeability. It is most often symptomatic of left ventricular heart failure, but can also be a complication of mitral stenosis, aortic stenosis, altitude sickness, acute hypertension, volume overload during intravenous therapy, or reduced serum oncotic pressure, as in patients who have nephrosis, cirrhosis, or hypoalbuminemia. During the initial stage of pulmonary edema, patients may complain of restlessness and anxiety and the feeling that they are getting a common cold. Other signs include a persistent cough, slight dyspnea, and intolerance to exercise. On auscultation, rales can be heard over the dependent portion of the lung. As fluid continues to fill the pulmonary interstitial spaces the dyspnea becomes more acute, respirations increase in rate, and there is audible wheezing. The cough becomes productive of frothy sputum tinged with blood, giving it a pinkish hue. Eventually, if the condition persists, the patient becomes less responsive to stimuli as levels of consciousness decrease. Ventricular arrhythmias develop and breath sounds diminish. In some patients these phases are telescoped as the pulmonary edema develops rapidly and the final stages of respiratory insufficiency are evident in a very short period of time. Treatment is aimed at enhancing gas exchange, reducing fluid overload, and strengthening and slowing the heart beat. To accomplish these goals the patient is often given oxygen by mask or through mechanically assisted ventilation. Drug therapy includes diuretics to remove excess alveolar fluid and morphine to relieve anxiety and reduce the effort of breathing. Administration of other medications depends on the cause of the edema, as well as what other problems the patient may be having. vasogenic edema that characterized by increased permeability of capillary endothelial cells; the most common form of cerebral edema. 1. An accumulation of an excessive amount of watery fluid in cells or intercellular tissues. 2. At the gross level, used to describe the physical sign commonly likened to swelling or increased girth that often accompanies the accumulation of fluid in a body part, most often a limb. cytotoxic edema cerebral edema caused by hypoxic injury to brain tissue and decreased functioning of the cellular sodium pump so that the cellular elements accumulate fluid. dependent edema edema in lower or dependent parts of the body. edema neonato´rum a disease of premature and feeble infants resembling sclerema, marked by spreading edema with cold, livid skin. pitting edema that in which pressure leaves a persistent depression in the tissues. pulmonary edema diffuse edema in pulmonary tissues and air spaces due to changes in hydrostatic forces in capillaries or to increased capillary permeability, with intense dyspnea. vasogenic edema cerebral edema in the area around tumors, often due to increased permeability of capillary endothelial cells. 1. Medicine An excessive accumulation of serous fluid in tissue spaces or a body cavity. 2. Botany A condition of plants characterized by blisterlike swellings on the leaves or other parts, caused by an accumulation of water. the abnormal accumulation of fluid in interstitial spaces of tissues, such as in the pericardial sac, intrapleural space, peritoneal cavity, or joint capsules. 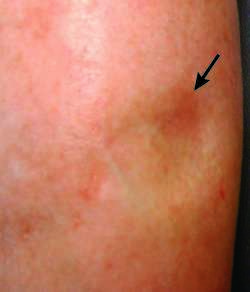 Edema may be caused by increased capillary fluid pressure; venous obstruction such as occurs in varicosities; thrombophlebitis; pressure from casts, tight bandages, or garters; congestive heart failure; overloading with parenteral fluids; renal failure; hepatic cirrhosis; hyperaldosteronism such as in Cushing's syndrome; corticosteroid therapy; and inflammatory reactions. 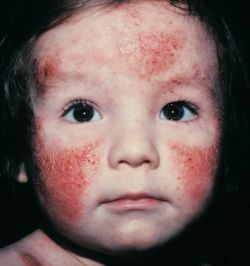 Edema may also result from loss of serum protein in burns, draining wounds, fistulas, hemorrhage, nephrotic syndrome, or chronic diarrhea; in malnutrition, especially kwashiorkor; in allergic reactions; and in blockage of lymphatic vessels caused by malignant diseases, filariasis, or other disorders. Treatment of edema focuses on correcting the underlying cause. Potassium-sparing diuretics may be administered to promote excretion of sodium and water. Edematous parts of the body should be protected from prolonged pressure, injury, and temperature extremes. In the evaluation of tissue turgor, edema may be evaluated by position change, specific location, and response to pressure, as in pitting edema when pressing the fingers into the edematous area causes a temporary indentation. An ultrasound evaluation of the affected extremity is indicated to rule out thrombosis. When a limb is edematous as a result of venous stasis, elevating the extremity and applying an elastic stocking or sleeve facilitate venous return. Also spelled oedema. See also anasarca, lymphedema. edematose, edematous, adj. Fluid retention, water retention Physical exam An excess of fluid in cells or tissues due to disease or injury, quantified as 1+, 2+, 3+. See Angioneurotic edema, Brawny edema, Cerebral edema, Cyclic edema, Cytotoxic edema, Flash pulmonary edema, Hereditary angioneurotic edema, High-altitude cerebral edema, High-altitude pulmonary edema, Leukoedema, Macular edema, Malignant edema, Pedal edema, Pseudopapillaedema, Pulmonary edema. An accumulation of an excessive amount of watery fluid in cells, tissues, or serous cavities. Edema may result from increased permeability of the capillary walls; increased capillary pressure due to venous obstruction or heart failure; lymphatic obstruction; disturbances in renal function; reduction of plasma proteins; inflammatory conditions; fluid and electrolyte disturbances, esp. those causing sodium retention; malnutrition; starvation; or chemical substances such as bacterial toxins, venoms, caustics, and histamine. Diagnostic studies ( thorough history, physical examination, urinalysis, serum chemistries and liver functions, thyroid function, and chest x-ray) help determine the cause and guide treatment. Bed rest helps relieve lower extremity edema. Sitting with the feet and legs elevated may also reduce edema in the lower extremities. Dietary salt should be restricted to less than 2 g/day. Fluid intake may be restricted to about 1500 ml in 24 hr. This prescription may be relaxed when free diuresis has been attained. Diuretics relieve swelling when renal function is good and when any underlying abnormality of cardiac function, capillary pressure, or salt retention is being corrected simultaneously. Any effective diuretic may be used. Diuretics are contraindicated in preeclampsia and when serum potassium levels are very low (< 3.0 mEq/dl). They may be ineffective in edema associated with advanced renal insufficiency. The diet in edema should be adequate in protein, high in calories, and rich in vitamins. Patients with significant edema should weigh themselves daily to gauge fluid loss or retention. Edema is documented according to type (pitting, nonpitting, or brawny), extent, location, symmetry, and degree of pitting. Areas over bony prominences are palpated for edema by pressing with the fingertip for 5 sec, then releasing. Normally, the tissue should immediately rebound to its original contour; therefore the depth of indentation is measured and recorded. The patient is questioned about increased tightness of rings, shoes, waistlines of garments, and belts. Periorbital edema is assessed; abdominal girth and ankle circumference are measured; and the patient's weight and fluid intake and output are monitored. Fragile edematous tissues are protected from damage by careful handling and positioning and by providing and teaching about special skin care. Edematous extremities are mobilized and elevated to promote venous return, and lung sounds auscultated for evidence of increasing pulmonary congestion. Prescribed therapies, including sodium restriction, diuretics, ACE inhibitors, protein replacement, and elastic stockings are provided, and the patient is instructed in their use. Swelling of the brain. It may be caused by increased permeability of brain capillary endothelial cells, focal strokes, swelling of brain cells associated with hypoxia or water intoxication, trauma to the skull, or interstitial edema due to obstructive hydrocephalus. Edema due to congestive heart failure. It is most apparent in the dependent portion of the body and/or the lungs. Edema of the lower extremities or, if the patient is lying down, of the sacrum. Swelling of the retina resulting from leakage of fluids from damaged blood vessels in the eye. It is a major cause of visual loss in diabetics, and is related to poor control of blood glucose. Initially, hoarseness and, later, complete aphonia characterize this condition. Other symptoms are extreme dyspnea, at first on inspiration only, but later also on expiration; stridor; and a barking cough when the epiglottis is involved. Pulmonary edema that may occur in aviators, mountain climbers, or anyone exposed to decreased atmospheric pressure. Edema associated with inflammation. The cause is assumed to be damage to the capillary endothelium. It is usually nonpitting and localized, red, tender, and warm. Edema of the larynx, usually resulting from allergic reaction and causing airway obstruction unless treated. Therapy consists of intravenous or intratracheal epinephrine, emergency tracheostomy, or both. Rapid destruction of tissue by cutaneous or subcutaneous infections, such as anthrax or clostridial species. Pulmonary edema occurring in a patient with upper airway obstruction and negative intrapleural pressures, e.g., in a child with epiglottitis. Edema in newborn, esp. premature, infants. This condition is usually transitory, involving the hands, face, feet, and genitalia, and rarely becomes generalized. Edema of the lower leg anterior to the shin (the tibia). A potentially life-threatening edema in the interstitium and alveoli of the lungs. The collected fluid may block the exchange of oxygen and carbon dioxide and produce respiratory failure. Fluid may seep out of the alveolar capillaries if these blood vessels are damaged and become excessively permeable to liquids (noncardiogenic pulmonary edema) or if hydrostatic pressures within blood vessels exceed the strength of the normal alveolar capillary wall (cardiogenic pulmonary edema). Cardiogenic pulmonary edema can result from any condition that compromises left ventricular function, causing elevations in pulmonary venous and capillary hydrostatic pressures (congestive heart failure), including myocardial infarction, ischemia, or myocardial stunning; severe valvular heart disease; arrhythmias; excessive intravenous fluid administration; and diastolic dysfunction. Noncardiogenic pulmonary edema usually results from blood vessel injury, as happens in the adult respiratory distress syndrome (sepsis, shock, aspiration pneumonia, airway obstruction). Occasionally, protein-rich fluid floods the lungs from drug exposure (such as heroin overdose), hypoalbuminemia, high-altitude exposure (mountain sickness), fresh water aspiration in near drowning, hemorrhage in or around the brain, or other conditions. Pulmonary edema can occur as a chronic or acute condition. Chronic symptoms include dyspnea or exertion, nocturnal dyspnea, orthopnea, and cough. When pulmonary edema develops rapidly, patients experience a rapid onset of shortness of breath and suffocation and often demonstrate labored, noisy breathing; cough producing frothy, bloody sputum; gasping; anxiety; palpitations; and altered mental status caused by inadequate oxygenation. Signs of the condition include a rapid respiratory rate, heaving of the chest and abdomen, intercostal muscle retractions, diffuse crackles on lung exam, and, often, cold, clammy skin with diaphoresis and cyanosis. Tachycardia, jugular vein distension, and a diastolic (S3) gallop occur. As cardiac output decreases, the pulse becomes thready, and blood pressure falls. Pulmonary artery catheterization helps identify left-sided failure (elevated pulmonary wedge pressures), and arterial blood gases show hypoxia. Profound respiratory alkalosis occurs when patients hyperventilate when trying to increase their oxygenation; acidosis may occur with respiratory fatigue and failure. To improve the movement of air into and out of the chest, the patient will often sit upright to breathe and resist lying down. Oxygen (in high concentrations by cannula, face mask, or nonrebreather mask) should be administered immediately. Assisted ventilation (continuous positive airway pressure [CPAP] or intubation with mechanical ventilation) may be needed to reach acceptable levels of PaO2 and improve acid-base balance. Morphine sulfate, nitrate vasodilators (IV nitroglycerin or nitroprusside) and loop diuretics are typically given to patients with cardiogenic pulmonary edema to improve dyspnea, alter preload and afterload on the heart, and promote diuresis. Angiotensin-converting enzyme inhibitors, inotropic drugs (digoxin), antiarrhythmic agents, beta-adrenergic blockers, human B-type natriuretic peptide, and phosphodiesterase inhibitors may be used in selected circumstances. Bronchodilators may also be administered. Depending on the underlying cause, invasive interventions may occasionally include coronary angiography, intra-aortic balloon pump therapy, or surgical interventions such as coronary artery revascularization or valve repair, or ventricular assist device therapy. The outlook is good if the condition is stabilized or reversed with treatment. The patient's head is elevated; respirations and ventilatory effort are assessed. Oxygen is administered as prescribed, with care taken to limit the flow rate in patients whose respiratory drive is compromised. The lungs are auscultated for adventitious breath sounds such as crackles, gurgles, and wheezes, and the heart is assessed for apical rate and gallops. The patient is monitored for a cough productive of pink, frothy sputum. The skin is checked for diaphoresis and pallor or cyanosis. A medication history is collected, esp. for cardiac or respiratory drugs and use of recreational drugs. The patient's cardiac rate and rhythm, blood pressure, and oxygen saturation levels are monitored continuously. An intravenous (IV) line administering normal saline solution (NSS) is inserted at a keep-vein-open rate to provide access for medication administration. Prescribed first-line drug therapy is administered, and the patient's response to the drugs is evaluated. IV morphine slows respirations, improves hemodynamics, and reduces anxiety. It should be administered before initiating continuous positive air pressure (CPAP). CPAP improves oxygenation and decreases cardiac workload, thus decreasing the need for intubation and ventilation with positive end-expiratory pressure (PEEP). An indwelling urinary catheter is inserted to monitor the patient's fluid status; diuresis should begin within 30 min of administration of an IV loop diuretic. Pulmonary edema is a life-threatening respiratory emergency. Everyone involved with the patient must remain calm and quiet, provide ongoing reassurance, and validate everything occurring through basic and simply understood explanations. After the crisis resolves, health care providers should discuss with the patient his or her feelings about the episode and give thorough explanations of what occurred. The at-risk patient is taught early warning signs to act on immediately (such as weight gain or increasing peripheral edema), in an effort to recognize and prevent future episodes. Medications and dietary and lifestyle restrictions are explained (low-sodium diet, losing weight, smoking cessation), and written information provided for home review. The patient should be encouraged to enroll in a cardiac rehabilitation program (as applicable) for regular exercise tailored to his condition. Edema caused by a local collection of pus. Alveolar flooding that occurs after a collapsed or trapped lung reinflates, e.g., after the draining of a pleural effusion or the evacuation of a pneumothorax. A form of edema worsened by excess sodium in the diet. Tissue swelling occuring after blunt or penetrating injury. n abnormally high fluid accumulation in the interstitial tissues; often an indication of other health problems. The presence of an excessive amount of fluid in or around cells, tissues or serous cavities of the body. In the eye oedema can occur in the cornea, the conjunctiva, the uvea, the retina, the choroid, and the ciliary body. Corneal oedema usually accompanies eye diseases, or contact lens wear with low oxygen transmissibility. Corneal oedema is easily seen with a slit-lamp using retroillumination or sclerotic scatter illumination. Quantitatively, it can be assessed with the addition of a pachometer that measures corneal swelling. Beyond about 4% swelling, there appear striae (wispy greyish-white lines usually vertical) in the stroma. Beyond about 8% swelling, there appear folds (dark lines) believed to represent physical buckling of the posterior corneal layers. Corneal swelling of 15% or greater, which indicates a gross separation of the collagen fibres of the stroma, results in a hazy or cloudy appearance of the cornea. There is a physiological oedema occurring during sleep in every human cornea amounting to an increase in thickness of about 4%. Corneal oedema gives rise to the appearance of haloes around lights, photophobia, spectacle blur, losses in corneal transparency and sometimes stinging. Management depends on the cause and tissue involved. If due to contact lenses, refitting with daily wear lenses of higher oxygen transmissibility and reducing wearing time usually solves the problem. Note: also spelt edema. See endothelial blebs; central corneal clouding; hypoxia; silicone hydrogel lens; oxygen permeability; critical oxygen requirement; pachometer; overwear syndrome. 1. Excessive fluid in cells or intercellular tissues. 2. At the gross level, used to describe physical sign commonly likened to swelling or increased girth that often accompanies fluid accumulation in a limb. n the accumulation of fluid in the tissues or in the peritoneal or pleural cavities. Primary factors favoring edema are increased capillary hydrostatic pressure (increased venous pressure), decreased osmotic pressure of plasma (hypoproteinemia), decreased tissue tension and lymphatic drainage, increased osmotic pressure of tissue fluids, and increased capillary permeability. Additional renal and hormonal factors are important. Clinical manifestations may consist of a steady weight gain or localized or generalized swelling. n an edema caused by venous congestion in association with congestive heart failure; tends to appear first in such dependent parts as the legs. n an edema that changes its position with the posture of dependent parts (e.g., edema of the legs in progressive heart failure). n an edema caused by fluid accumulation in the soft tissues of the larynx. The condition, usually inflammatory, may result from an infection, injury, allergy, or inhalation of toxic substances. n an edema of the eyelids in association with local injury, allergic reactions, hypoproteinemia, trichinosis, and myxedema. n a persistent indentation of the skin when pressure is applied to an edematous area. an abnormal accumulation of fluid in the cavities and intercellular spaces of the body. Edema can be caused by a variety of factors, including hypoproteinemia, in which a lowered concentration of plasma proteins decreases the osmotic pressure, thereby permitting passage of abnormal amounts of fluid out of the blood vessels and into the tissue spaces. Some other causes are poor lymphatic drainage, increased capillary permeability (as in inflammation), and congestive heart failure. See also anasarca, ascites, hydrothorax, hydropericardium and anatomically located edemas, e.g. brain, corneal, pulmonary edema. is part of the syndrome of congestive heart failure. It comprises 'bottle jaw', jugular vein engorgement, edema of the brisket and underline, and ascites, hydrothorax and hydropericardium. See also congestive heart failure. edema affecting most severely the lowermost parts of the body. 1. in pigs a highly fatal disease of young pigs in the weaner and grower age groups characterized by incoordination, a hoarseness of voice, weakness, flaccid paralysis and blindness. Edema of the eyelids, face and ears is diagnostic but is seldom visible on clinical examination. The course is short, often less than 24 hours, and many pigs are just found dead. The disease is caused by the opportunistic proliferation of specific serotypes of Escherichia coli in an intestinal environment brought about by a change to a diet more dense in carbohydrates. These have pilus attachment antigens that allow attachment of the organism to the small intestines and produce a verotoxin (VT2e) which produces an increase in vascular permeability in the target vessels in the CNS with resultant neurological disease. Called also gut edema, bowel edema. 2. in goats a disease caused by Mycoplasma F38; a fatal cellulitis. edema is a common accompaniment of hepatic disease because of the decline in production of plasma proteins and a fall in the blood's hydrostatic pressure. Ascites may occur independently because of portal hypertension when there is severe liver disease and obstruction to blood flow in the portal vein. caused by insufficient production of albumin or excess loss through a protein losing enteropathy. See hepatic edema (above), Johne's disease, proliferative enteropathy, type II ostertagiasis. a disease of market age turkeys of unknown cause and characterized by edema of the legs and focal muscle necrosis. noncardiogenic pulmonary edema. See acute respiratory distress syndrome. edema of the newborn. See lymphatic vessel obstruction. edema in which pressure by the clinician's finger leaves a persistent depression in the tissues. may be generalized and constitute anasarca. Local areas of edema occur in such other conditions as angioedema and urticaria, edematous plaques in dourine and infectious equine anemia, and in purpura hemorrhagica. 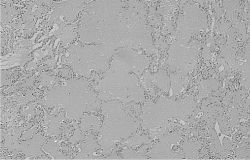 that characterized by increased permeability of capillary endothelial cells; the most common form of brain edema. Q. what is "pulmonary edema" and what are the risks? my Dr. told me I'm in a risk group for pulmonary edema, he tried to explain what it is but i didn't understand fully...if someone may give me a brief explanation- I'll appreciate it! A. pulmonary edema occurs when, lets say, your heart left ventricle stops working properly and your right ventricle works fine. that means your lungs getting lets presume- 1 liter of blood -but your left ventricle can pump out of it only 990 ml. that means you have high blood pressure in your lungs and fluid comes out of blood vessels and fills your lungs, making it harder and harder breathing. La exploracion fisica se ha empleado para valorar la hidratacion, aunque la presencia de edemas puede verse influenciada por otras circunstancias, como el grado de nutricion, la insuficiencia vascular o la funcion cardiaca.